Welcome to Cafés for All. 'Cafés for All' is a simple idea, flexible and adaptable, easy to use and, it works! Cafés for All are designed to bring people together in an informal, sociable setting in which all can develop and share knowledge, information and skills , learn alongside others and network. 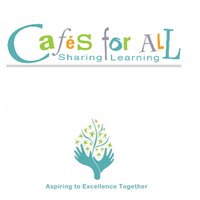 The Cafés for All - Sharing Learning training programme has, at its core, a commitment to assist parents, schools and the wider community to come together to support and enhance learning by engaging the strengths and assets of all. For us, the word Café represents ‘community assets for education’. In this we subscribe to the vision and work of the Café Institute, Calgary and wish to acknowledge their support in our work. The Cafes for All training programme has followed on from the Reading Café initiative (developed in Norfolk by Julie Westrop) which operates very successfully in numerous early years settings, schools and community settings.